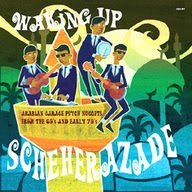 Lately I have been digging on the V/A LP called Scheherazade - Arabian Garage Psych Nuggets from the 60's and early 70's. Check out a great review of it here. The title of the record pretty much sums up the running theme of the record in a nutshell. My favorite track has to be from a band called The News titled "From the Moon" Besides all the kooky space effects on all the instruments and voices, the lyrics "We come from the moon / we looking for bees" makes this song an out of this world hit in my book. It is in fact those are the only lyrics to the song at all. Genius! I was curious to know more about this band and wouldn't you know it, someone was kind enough to give them a Myspace page. The Moon song is not featured on the page but be sure to check out this great band from Lebanon. They are easily the coolest thing to come from there since the character Clinger from MASH. I kid, I am sure there are all sorts of killer stuff from Lebanon but I am too square and too clueless to know about. The record version of Scheherazade is limited to 500 copies so I would say if you are tempted to pick up the LP the time to do so is now.